In comparison to Chichén Itzá Uxmal was a welcome and wonderful experience. Part of it was the fact that by driving we got there at 8:30 and there was nobody there. The entrance is modern, extremely clean and civilized. The guides (we didn't use one) all seemed learned. 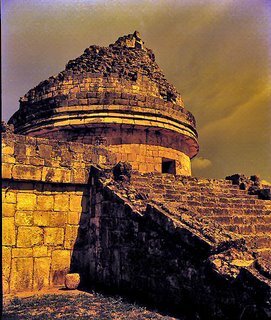 Rebecca objected to all the talk of our Juan Jara in Chichén so we saw the ruins without any explanation. Except for not being allowed to climb the extremely steep steps (I did so when I took the pictures you see here about 27 years ago) we were able to explore the ruins with all their intersting ups and downs. Rebecca was more interested in the many iguanas of the site and decided that she did not need a hat to run around trying to follow the lizards. A few hours later she felt faint in our air conditioned Nissan (that drove like a truck as it had no power steering). She sort of recovered when we arrived at the cenotes I wrote about yesterday. A few hours later Rebecca figured out she had suffered from heat stroke. 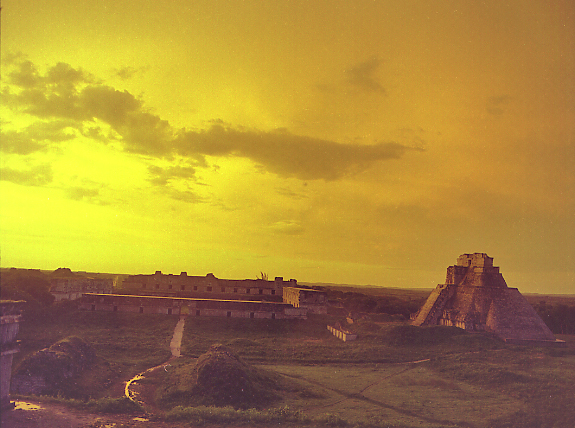 The stone colour of the Uxmal ruins is an attractive pink unlike the bluish cast of Chichén. 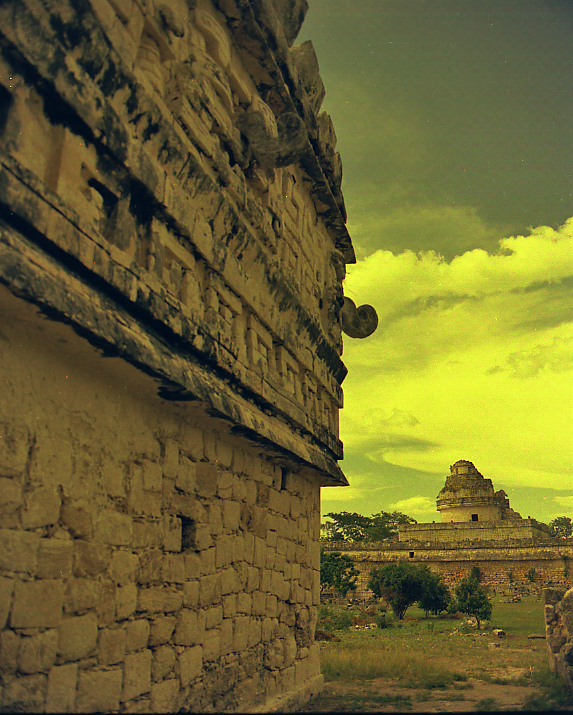 There was little in Uxmal to remind us of death and war. The ruins are inhabited by thousands of swallows that fly in and out from the corbled arches. Even Rosemary managed to smile and enjoy Uxmal. But the smiles were even more plentiful when we feasted on some Mexican lemon (sort of like a lime) slush drinks. The cold went up Rebecc'a nose but she still finished her drink. While I cannot post here the picture, I took a photograph of the Palacio de los Gobernadores which included (using an extreme wide angle) a reproduction of Catherwood's exact version of the same scene but done around 1842. Perhaps tomorrow I will find the time to recount how it was that we swam in three cenotes and that the experience is one that is almost impossible to explain. It felt like we were in another time almost as if were were followind the footsteps of Stephens and Catherwood. It was in the cenotes that I accidentally discovered that the night scene setting of Rebecca's pink Samsung digital camera was the one that managed to capture the extreme contrast of the scene from the bright hole to the cenote to the darker (but crystal clear) waters below. While driving back to Mérida (7pm), in roads so narrow that we had to slow down to a crawl to make sure the incoming vehicle did not side swipe us, we remembered we had not eaten anything since our 7am breakfast at the hotel. We bathed at the hotel and walked to Los Almendros (in Parque de la Mejorada). While I never really drink I have been enjoying one bottle of Yucatecan, Cerveza Montejo. As soon as we had demolished our Poc Chuk (flattened and grilled pork smothered in red onions) Rebecca was nodding off. We walked home in the hot evening and I mentioned to Rosemary that it all was similar to our walks, 38 years ago, in Veracruz. We could smell the salt air of a port even though Merida is not a port. Around 1953 my mother had some interesting Mexican friends in Mexico City. Two stand out. 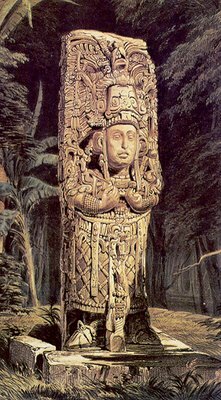 One was Alma Reed who inspired the Mexican song La Peregrina and the other was a mysterious woman called Nicte Há who said she was a Mayan princess. One day my mother came home from a party and woke me up to show me what Nicte Há had given her. I expected to see something in her hand but she pointed at the lapel of her blouse. I saw a tiny gold chain and a largish jewel that was moving. This was my first glimpse of the makech beetle which in the 50s was all the rage in Mexico City cocktail parties. The beetle eats rotting wood (it must be kept moist) and if one does not handle it too much it can live up to 4 or 5 years. On Wednesday night Rebecca pointed at a shoe box in a store selling Yucatecan crafts. It had several jeweled beetles and I was hit by nostalgia for Mexico in the 50s. I explained to Rebecca the beetle´s story and offered to buy her one. She began to cry shouting at me that I was cruel to accept such cruelty to an animal that was not a domestic animal. She cried all the way home as I tried to explain that in the simpler times of my mother´s day we would never have thought of such things. This was to no avail. Rebecca stopped crying as soon as we got to her hotel. As soon as she opened her Judy Blume novel she began to laugh. When I turned off the lights she continued until I pointed out that she was going to wake up an exhausted Rosemary. With the logic that her father had once owned a pet tarantula she asked to see the makech again. This we did yesterday. Now she is wondering how she could hide the two inch beetle in a match box and go through customs. Anybody there know what would happen if the magic Mayan beetle gets a shot of X-rays in Rebecca´s hand luggage? We discussed that she was right in thinking the practice was and is cruel. But she is still undecided. On Tuesday in Celestún a sudden burst of speed of the launch that was taking us to see the flamingos wrenched my prescription (and bi-focal) sunglasses from my face and they disappeared in the waters of the lagoon. By the time I asked our boatman to stop they were long gone. To avoid the incredible throngs of Uxmal Rosemary wanted to persuade me to drive a rented car to the Mayan ruins. We would leave early enough to arrive at opening time which is 8am. But I was not prepared to drive without sunglasses. So yesterday Wednesday I went to a nearby optical store to see if they had clip-ons. 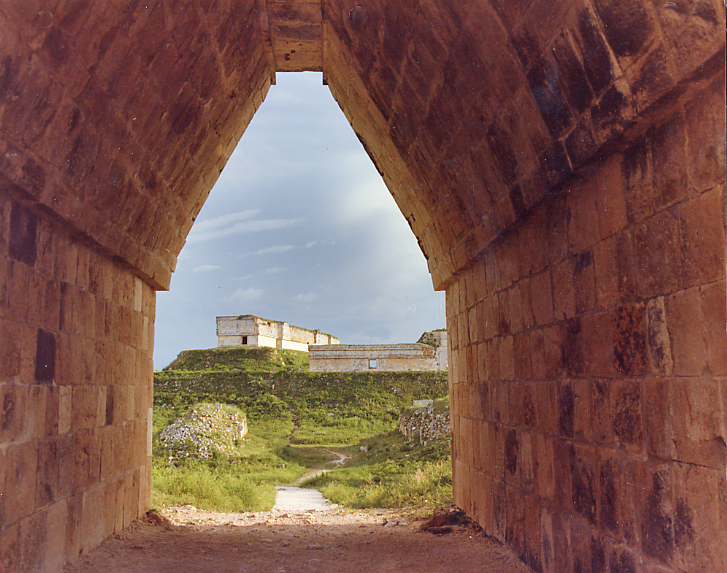 For those who may be reading this now, we left for Uxmal at 7:15 in a rented Nissan. My new prescription and bi-focal sunglasses were delivered yesterday at 5pm! We plan to then drive to the three cenotes or sinkholes at Cuzamá, Chelentún, Chansinic'ché and Bolonchoojol. The latter means nine leaks in Mayan. To begin with what you see here is a stock image I found in Google Images. I do not have any instant pictures of flamingos even though we went to the ecological biosphere/reserve of Celestún today. It was an hour and half drive due north from Mérida. We got pretty close in our 8 person launch but only a telephoto could possibly get them any closer. Rebecca was slightly disappointed that her digital camera was not doing the scene justice. But then some flamingos flew by and curiously their colour was deeper in flight than when resting on the very shallow waters of the Celestún lagoon. Watching them fly by (this happened repeated times) was thrilling in ways that the Discovery Channel documentaries on this bird could never even get close to. Rebecca mentioned the stench of the lagoon and I told her it was far better than seeing it without any smell from her living room chair. Some 40 years ago I took my first cousin David Humphrey (he was 8) to the Mexico City Zoo. I showed him one of my favourite animals, a hippo in the water. David shocked me with, "He's boring. The ones in Disneyland make lots of noise and open their mouths." I tried to explain to David that unlike the hippo in Disneyland the one we were watching was flesh and blood. I resolved then to never go to Disneyland. The closest I ever got was dropping off Rosemary, Ale and Hilary at the door. When Rebecca, Bruce and Hilary were about to leave for Disneyland is just happened to be the morning of September 11. To date, Rebecca has not been to see plastic hippos. An added bonus at Celestún was a trip through dense mangroves and swimming in a ojo de agua which is a large clear pool in the middle of the mangrove caused by the blending of an spring with the lagoon´s sea water. Rebecca thought it was a treat to swim in it even though I tried to tell her that there were crocodiles (a patent lie). On Monday I satisfied my curiousity and went to Casa Catherwood. They have on display 25 original lithographs published by Catherwood in England. Originally he did them to illustrate his collaboration with American writer/diplomat John L. Stephens, Incidents of Travel in Central America, Chiapas and Yucatan which was printed after their trip in 1842. It was a special treat as I have seen reproductions (many very poor) in books for years but never an original from the limited edition of 300. To see these lithographs in full colour without the humanity of thousands that is the reality of 2007 is thrilling as is to see the ruins before their improved restoration. 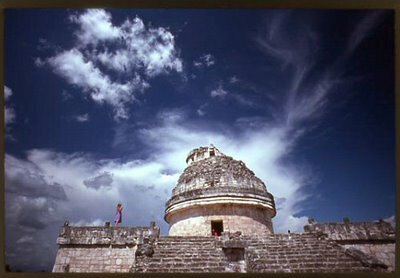 The original jungle has been removed and one is mercy to the implacable Yucatan sun over one's head. 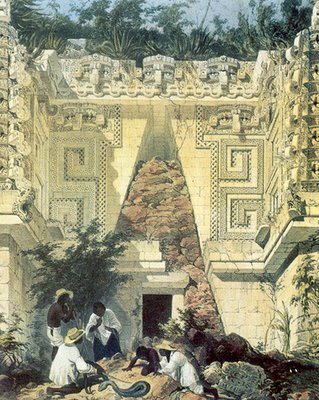 Not as well known as Stephens's and Catherwood's original Incidents of Travel in Central America, Chiapas and Yucatan is their second effort, Incidents of Travel in Yucatan. 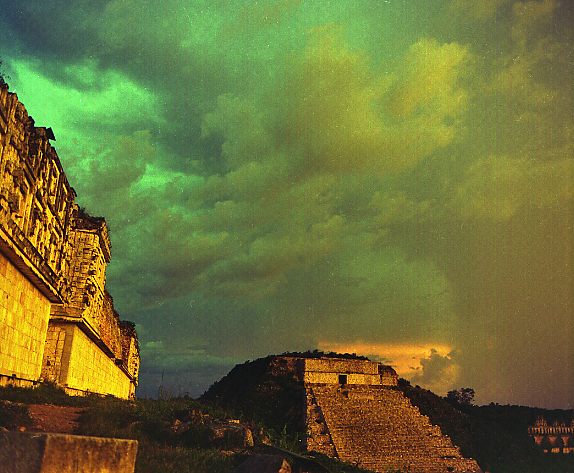 In the first book both travelers have to leave Uxmal suddenly as Catherwood comes down with a terrible fever. 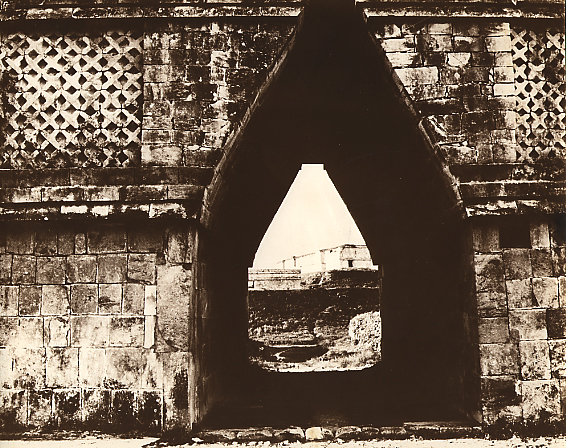 In Incidents of Travel in Yucatan, there are new Catherwood lithographs but there is also a detailed history of the conquest of Yucatan by the Spaniards and interesting account on how almost Texas and Yucatan became a country on its own. There is also a one year record (September 1842 to August 1843) of the temperatures in Merida in the morning, noon and the evening. The temperatures, similar to the ones we are experiencing now, do not reflect the extremely high relative humidity. When possible, Rebecca wants to be in our hotel pool! Curiously only now did I find out that Catherwood used the camera obscura to help him get his sketches right. And both Stephens and Catherwood started a short lived (they experienced a brief beginner's luck) venture of taking portraits of beautiful meridanas using the complicated method of the Daguerreotype. None of the above images that I took all those years ago at Chichén would be possible now. I would have never suspected that at least ten thousand people would converge daily there as was the case today. People were everywhere. Rebecca goto bored as nobody is allowed to climb any of the ruins. In a few years we would make them disappear more quckly than natural erosion. Returning in our tour bus we had a flat and the flat was repaired at a charming little town called Hoctún. A lady with red hair protested but the rest of us took the opportunity to ride the towns taxis called tricitaxis in which a driver pedalled behind us as we sat under a seat and canopy in the front. The unplanned events that always happen in Mexico can be charming as this one was. In a few days we are going to take a little bus to the port city of Progreso that is about 30 minutes away. It is the favourite retreat for the meridanos. It has a very long peer and a white sand beach. Tourists avoid this beach as they opt for the more popular beach in Cancun in the nearby state of Quintana Roo. As we stroll on the malecón (seaside walk)both Rosemary and I will be taken back 37 years when in the Veracruz malecón we were surprised by a sudden norte where I took this picture of her with Ale. Yesterday we took a cab to el Fogoncito and had some carne al carbon tacos. I drank horchata which is a drink made from rice flower, water, sugar and cinammon. For dessert Rebecca had crepes smothered in cajeta (dulce de leche in my country as this word is unmentionable). From there we hopped on a bus and went to a Sanborns which is always Christmas in July. Rebecca settled for a cute plush armadillo made in Indonesia just like Chippy, a beaver we bought last year in Sanborns in Morelia. I had to control myself from spending too much on the excellent variety of books in Spanish that one always finds in Sanborns. Rosemary was undecided about buying her Carlos V chocolate which she finally bought at a store near the hotel. Rebecca seems to want to swim all the time so we did this in the evening. It rained and thundered for a while. Wheather here, unlike anything else, seems to be fast moving. Today we will spend time in the plaza principal where there are all kinds of all day festivities. In between Rebecca will find time to do her swimming. 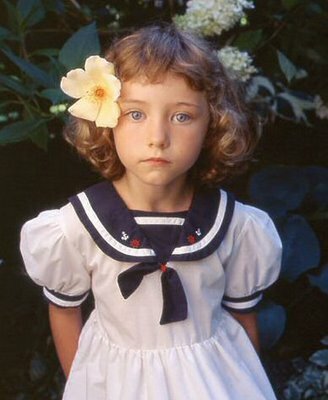 Alas we did not find a sailor dress in Sanborns as I did some years ago at Cancun. Perhaps we just might buy a dress for Rebecca today. But the problem is that Rebecca does not want to wear dresses as she says she looks girly in them.